Whether you are an experienced professional or a recent college grad, Citizant looks for enthusiastic and trustworthy people who are willing to tackle any tasks required to help our customers succeed. 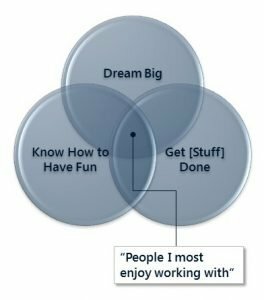 The Venn Diagram on the right, which went viral in August 2014, best describes the people we want to work with. Citizant’s expert recruiters search diligently to find the right people – who make all the difference – due to our detailed staffing processes and high standards. We designed our interviewing experience to select the best candidate for our culture and customers, AND to give great candidates insights into Citizant. We do this because changing jobs is both stressful and difficult, and we want our candidates to feel comfortably informed in making a decision to join us. Below are some of the highlights of our hiring process. Once you’ve submitted your résumé our recruiting team will provide you with more information. We want you to know more about the position and get an understanding on how you may meet the requirements. We are a very interactive culture and as such, we build in time to meet face to face (or video chat) with each of our perspective candidates. During this interview, you will meet with our hiring manager and another senior leader. You’ll have a chance to learn more about Citizant’s culture, the team you will work with, and any unique aspects of this position. Our team members in turn will get to know more about you, both professionally and personally. Our methodology in this in-depth meeting allows us fully discuss and understand the dynamics of a candidate’s work experiences and relationships.